GRAND RAPIDS (Michigan) April 18, 2018 – ArtPrize, the independently organized art competition recognized as one of the world’s largest annual public art events, today announced its list of professional jurors for the tenth annual event, which will be responsible for awarding $250,000 in juried prizes. Leading the ArtPrize jurors are Brooke Davis Anderson, the Edna S. Tuttleman Director of the Museum at the Pennsylvania Academy of the Fine Arts, Lauren Haynes, curator of contemporary art at Crystal Bridges Museum of American Art, and Ran Ortner, the internationally renowned artist and winner of the inaugural ArtPrize in 2009. Every year, ArtPrize distributes a half a million dollars in cash prizes, making the event the world’s largest art competition. 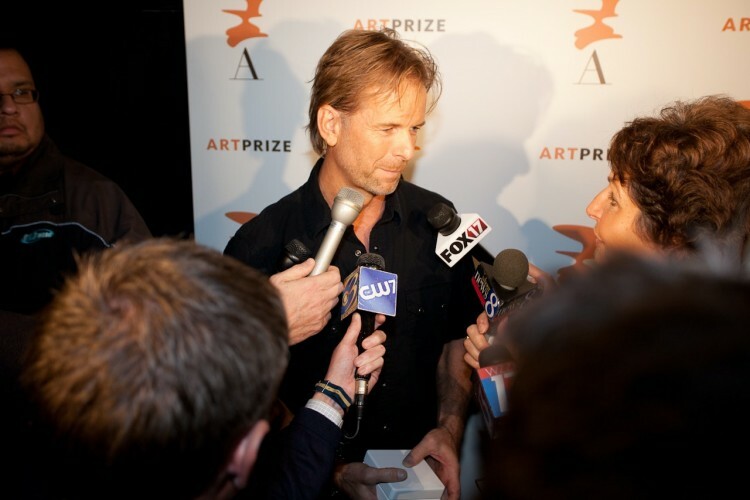 While more than 500,000 spectators take an active role as judge and critic to decide the public vote, the ArtPrize Juried Awards are decided by a group of internationally acclaimed art experts. ArtPrize presents five Juried Awards for artists. 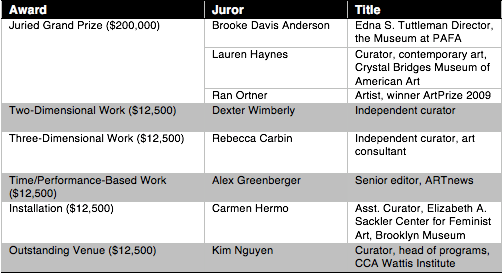 The Juried Grand Prize is selected by a committee of three, while the four Category awards are each chosen by a single juror with the help of local art professionals. There is also a Juried Award for Outstanding Venue, awarded to the curator of a Venue, rather than an artist. Keeping with the mission of openness and providing the potential for surprise, each juror is given the privilege of setting their own judging criteria for the prize. To exhibit, artists must secure space with one of more than 180 ArtPrize venues found within a three-square mile district of downtown Grand Rapids. Venues range from city parks to rooftops to museums to restaurants. In 2018, ArtPrize will distribute $500,000 in prizes, split between a decision of the voting public and the professional jury, firmly establishing the event as the world’s largest art prize based on total monetary prizes distributed. ArtPrize is open to any artist from around the world, organizers encourage participants to register any type of artwork at artprize.org. Artists are urged to sign up as early as possible to ensure a venue for their work, as relationships are already being made between artists and venues. Artist registration for ArtPrize 10 is underway now through June 7 at 5:00 p.m. EST. The ArtPrize 10 competition and festival is poised to be a spectacular 19-day event in celebration of its tenth year in collaboration with the community and The City of Grand Rapids. ArtPrize 10 takes place September 19 to October 7. Anderson is the Edna S. Tuttleman Director of the Museum at the Pennsylvania Academy of the Fine Arts. Prior to joining PAFA, she served as Executive Director of Prospect New Orleans/U.S. Biennial. With Prospect, Anderson revived the organization by bringing fiscally sound practices to the project, raising more than $4 million in 18 months to produce Prospect.3: Notes for Now, moving the staff offices from New York City to New Orleans, and reinvigorating the reputation of the triennial for New Orleanians and art world insiders alike. From 2010 to 2012 Anderson was Deputy Director of Curatorial Planning at the Los Angeles County Museum of Art (LACMA). In this role, Anderson oversaw the Watts Towers Conservation and Community Collaboration, and the "Curatorial Diversity Initiative," a Mellon-funded pilot program aiming to change the demographics of professionals in museums across the nation. She has been an Assistant Professor at Columbia University, City College of New York, and Winston-Salem State University. Haynes is the Curator of Contemporary Art Crystal Bridges Museum of American Art in Bentonville, Arkansas. Prior to joining Crystal Bridges in 2016, Haynes was Associate Curator of The Studio Museum in Harlem where she oversaw the care and collection of the permanent collection as well as acquisitions and exhibitions. A specialist in African American modern and contemporary art, she has curated numerous exhibitions including Alma Thomas (co-curated), currently on view at The Studio Museum; Speaking of People: Ebony, Jet and Contemporary Art; Stanley Whitney: Dance the Orange; and Carrie Mae Weems: The Museum Series. She has also overseen the Studio Museum’s noteworthy Artist-in-Residence program. Ortner is an independent artist living in Brooklyn, N.Y. In 2009 Ortner won the inaugural ArtPrize competition, significantly changing the path of his career. The New York Times covered the win with a half page image of Ortner’s winning painting, as well as the WSJ, BBC and NPR Studio 360. Following ArtPrize, Ortner's ‘Deep Water No. 1' was selected as the visual centerpiece of Le Bernardin and was featured in the New York Times. The following year Ortner was the focus of a long form interview on his life’s and work for The Sun Magazine’s issue on creativity. In 2013, the Dutch government commissioned ‘Element No. 5' as the visual centerpiece for the United Nations, World Water Day at the World Forum in The Hague. As an independent curator, Wimberly has organized exhibitions and developed programs at galleries and institutions around the world, including The Third Line (Dubai); KOKI ARTS (Tokyo); the Museum of the African Diaspora (San Francisco); and the Museum of Arts and Design (New York). Wimberly has served as Director of Communications at The Museum for African Art (New York); Director of Strategic Planning at Independent Curators International (New York); and Executive Director at Aljira, a Center for Contemporary Art (Newark). Carbin holds a Masters Degree in Curating Contemporary Art from Goldsmith’s College, University of London, UK. While working as an independent curator and art consultant in London she worked with a variety of clients and agencies including Artangel, Public Art Development Trust, British Broadcasting Corporation, the Corporation of London, West Ham United Football Club and the Saatchi Gallery. As Public Art Officer for the City of Toronto, Rebecca grew the City’s percent for art program and opened up commissioning opportunities to artists working in a variety of media and at all stages in their careers. Currently, Rebecca Carbin is Public Art Program Manager for Waterfront Toronto where she is responsible for all aspects of planning and commissioning art within the public realm of the designated Waterfront area. Rebecca is also Founder of I Heart Your Work Art Futures, an artwork production concept that brings a kick-starter approach to contemporary art patronage. Alex Greenberger is senior editor at ARTnews. His writing about film and video, art after the internet, and digital culture has appeared in the Village Voice, Architectural Digest, and Artspace. He lives in Queens. Hermo is Associate Curator, Elizabeth A. Sackler Center for Feminist Art at the Brooklyn Museum. Since joining the Brooklyn Museum’s curatorial team in June 2016, Carmen Hermo has curated Roots of "The Dinner Party": History in the Making (2017), co-organized Marilyn Minter: Pretty/Dirty (2016–17) and the Brooklyn presentation of Radical Women: Latin American Art, 1960–1985 (2018), and assisted with initiatives for the 10th anniversary of the Sackler Center, A Year of Yes: Reimagining Feminism at the Brooklyn Museum. Previously, Hermo was Assistant Curator for Collections at the Solomon R. Guggenheim Museum, where she served on the museum’s Young Collectors Council acquisition committee devoted to acquiring and supporting the work of emerging artists, and co-curated the contemporary collection exhibitions Now’s the Time: Recent Acquisitions (2012–13) and Storylines: Contemporary Art at the Guggenheim (2015). She has previously worked with the collections of the Whitney Museum of American Art and the Museum of Modern Art. Hermo is completing her M.A. in Art History at Hunter College, and lives in Jersey City, New Jersey. Nguyen is Curator and Head of Programs at The Wattis Institute at the California College of the Arts, where she is also a Lecturer in the Fine Arts and Curatorial Practice programs. Nguyen was formerly director and curator of Artspeak, an artist-run non-profit in Vancouver, Canada. She has presented exhibitions and publications with Alex Da Corte, Valérie Blass, Yuji Agematsu, Abigail DeVille, Aaron Flint Jamison, and Danh Vo, among many others, and recent and forthcoming exhibitions at the Wattis include Ken Lum: What’s old is old for a dog., and Susanne Kriemann: Canopy. Nguyen’s writing has appeared in exhibition catalogues and periodicals nationally and internationally, with recent texts published by the Vancouver Art Gallery, the Herning Museum of Art (Denmark), Mousse, and Pied-à-terre. Nguyen received the 2015 Hnatyshyn Foundation Award for Emerging Curators in Contemporary Canadian Art and the 2016 Joan Lowndes Award for excellence in critical and curatorial writing. She is currently completing her first collection of writings.